How far can your P1 take you? Apparently, a rare type of P1 peso coin issued in 1971 may make you an instant millionaire. According to several coin collectors in the Philippines, the rare coin has extremely high value because it is made of pure gold and only 100 pieces of it were released. 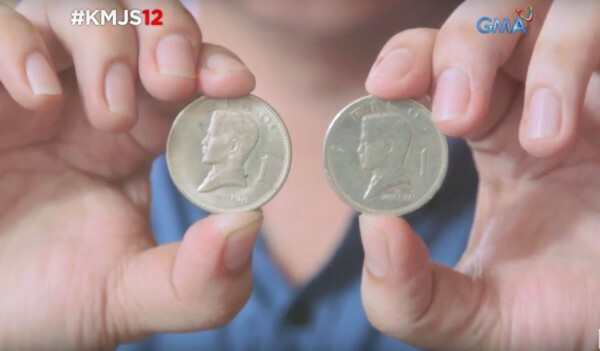 In a report by Kapuso mo Jessica Soho (KMJS), Roel, not his real name, revealed that P1 coins issued in 1971 are valued at around P200 to as much as P1 million. “May tumawag sa akin na taga-Quezon City. Mayroon ba daw akong 1971 na piso coins. Sabi ko wala sir maghanap ako. Sinabi ko sa kanya magkano ba bilihan mo sir. Sabi niya 1 million. 50% sa may-ari, 50% din sa nag-nenegotiate din sa coins. Yun ang motibo na naghanap talaga ako ng 1971,” Roel revealed. Upon learning that the coin will bring him fortune, Roel, a buyer and seller of old coins, decided to look for it. In 2015, he was able to purchase this type of coin for P10,000. Roel’s cousin John, not his real name, served as the middle man for transactions. Although many expressed interest in buying the coin, no one really bought it. Most of them only took pictures of the coin. The cousins believe that they had been used people who posed as buyers who used the photos to scam other people. In order to verify if the rare P1 coin really exists, the staff of KMJS consulted several experts. Boyet Manuel of the Philippine Numismatic and Antiquarian Society believes that the P1 coin owned by Roel has been manipulated as it is thinner compared to regular coins issued in 1972 and 1974. He believes that the coin was just made by a medal maker. “Ang orihinal supposed to be nakalagay ang seal ng Republika ng Pilipinas, nakalagay yung katagang Bangko Sentral, nakalagay yung date sa pagitan ng Bangko Sentral. Sayo nakalagay yung tinatawag nateng Noli Me Tangere, which is yung librong sinulat ni Jose Rizal,” Manuel explained. Meanwhile, Maja Gratia Malic, Deputy Director of Currency Issue and Integrity Office of the Bangko Sentral ng Pilipinas (BSP) verified that such coin wasn’t issued by the BSP. “Sa record ng Bangko Sentral wala tayong maipakita na ito ay nanggaling sa Bangko Sentral. I can’t find it sa aming website, wala din sa aming collection, wala din sa money museum namin. So far ang masasabi ko, yung coin na tinutukoy mo ay mukhang hindi galing sa Bangko Sentral,” Malic told KMJS.